Ron Johnson Heating & Air, Inc. specializes in maintenance, repair, and sales residential and commercial heating and cooling systems. We are dedicated to keeping your home or business comfortable and will work with you to lower your energy cost year round. On our first visit to your home or business Ron Johnson Heating & Air, Inc. will perform a complete and thorough inspection of your entire heating and air system. Inspection on the complete duct system to include under house or attic inspection. Proper sizing of returns and trunk line based on square footage and unit size. Check installation to ensure the R6 value is maintained. Provide written list of all repairs needed that are essential for optimal performance and comfort. First time inspections are done only when you are present. A complete explanation of all your questions or concerns can be provided in person at the time of the inspection. No work will be done without the customer's complete understanding of the needed services and of all charges for any services performed. Your presence ensures that we get to know you personally as a valued customer and allows you to see that we provide you with the quality and professional services that you are paying for. We are available 24/7 for emergency response. 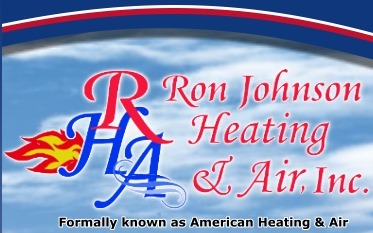 Ron Johnson Heating & Air, Inc.